This was a manga that I think I read on Mangafox. It's about two high school students. She is the kind of girl who amuses herself with an interest in the supernatural. He is very intelligent and very proud of his intelligence and rationality and scornful of her interest in such nonsense. Then he dies in an accident and discovers that he's a ghost and only she can see him. He convinces her to help him investigate other alleged hauntings because he hopes to meet another ghost now that he knows that ghosts are possible. The first case they investigate is a hoax perpetrated by a science teacher at their own school I think. 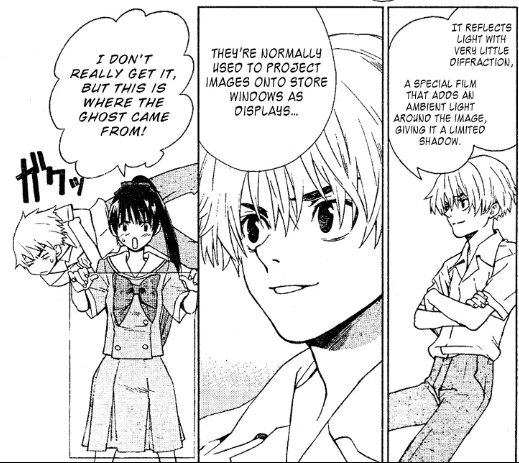 The trick involves using lasers against something applied to a classroom window so that it can be used to create a holographic image. 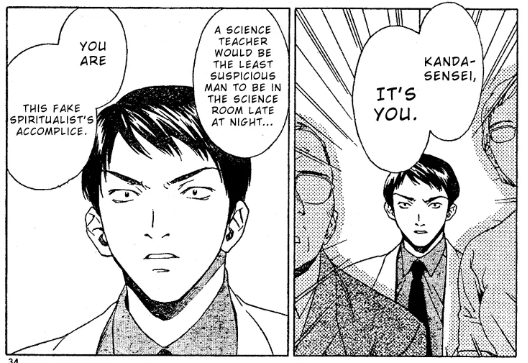 Ghost Logic (2004) by Hamanaka Akira and Kine Wosamu? It's a one-shot. Yumeko is a girl obsessed with the occult, but her best friend Satoru is a skeptic. But then, Satoru dies and comes back as a ghost that only Yumeko can see. Found with the Google query ghost "only * can see" site:myanimelist.net/manga. Not the answer you're looking for? Browse other questions tagged story-identification manga or ask your own question.